'HEAVENLY', 'SUPERB', 'PARADISE' - quotes from Guests. PLEASE NOTE: THIS PROPERTY IS NOT SUITABLE FOR CHILDREN UNDER 10 OR THOSE WITH LIMITED MOBILITY due to spiral stairs to roof sun terrace and interior stairs. Luxury on 3 floors for a '5-star' holiday in a panoramic gorgeous Canillas de Aceituno village setting with hills/sea view below and National Park behind. Designed by the owner, Suzanne, using the best 'ingredients' with 2 large (32/34sq.m.) en-suite bedrooms on ground and 1st floor, with blackout lined silk curtains, down pillows and dimmable lights. No squabbles about the best room as both are equally luxurious and large. Bathrooms have superb power showers, baths and double basins, proper hair-dryers + robes and slippers if required! All towels and beach towels are supplied. There's a separate utility/shower room too. Upwards to the stunning top floor contemporary open-plan living space + cargo lift, (so no need to carry up shopping/wine/logs!) and spacious dining terrace with built-in charcoal BBQ and pyramid gas heater for any chilly evenings. The kitchen is superbly equipped with all cooking gadgets, food processor, orange press, microwave and cutlery etc. (Even cookery books) Accessed from the living room via a spiral staircase there is a magnificent spacious roof terrace with adjustable sun-loungers, privacy screening/shade canopy and hot/cold shower and the most fabulous panoramas over the village and hills to the sea beyond! Within its own patio is a private and romantic solar-heated pool (5m x 2.7m) with a shower. (Temperature dependant on sunshine hours!) Casa Convento has the advantage of being part of the delightful 'pueblo blanco' of Canillas de Aceituno, while maintaining its own intimate atmosphere and privacy. FREE CONSTANT WI-FI INTERNET. NO KIDS UNDER 10. THIS IS A NO-SMOKING PROPERTY. Stunning location. Luxury and comfort. Privacy and romance. Spectacular views to the lake, mountains and sea. No need to quarrel over 'master bedroom' as both are equally spacious and luxurious! Amazing sunsets. 3 terraces. Very private, secluded swimming pool in its own patio. Al fresco dining on the third floor with built-in BBQ and gas 'pyramid' heater. Top quality interior decoration including bespoke art work by the owner! Kitchen is fitted with masses of the best equipment and gadgets. Unusual layout with a bedroom occupying an entire floor each on ground and first floors with open-plan living on the top floor and sunbathing terrace on the roof. Cargo lift to all floors. Log burner fire for winter. Underfloor heating for winter + Heated towel rails. Top end air-conditioning. Free Wireless internet. UK and Spanish TV. DVD player and CD player + library of CDs, DVDs and books. Beautiful solar-heated romantic 'Moroccan-style' pool with fountain spout. High end of village panorama. Charming and good-value village restaurants and bars. Friendly, very Spanish village with array of shops. National park of outstanding beauty and lovely walks from right behind Casa Convento. Please note that this house is not suitable for young children under 10 or people with limited mobility. CHANGEOVER DAY IS ON SATURDAY ONLY DURING HIGH SEASON. I CHARGE A SEPARATE £200 DEPOSIT AFTER YOUR FINAL PAYMENT DIRECTLY AGAINST DAMAGES, AIR-CON, HEATING. THIS WILL BE EXPLAINED IN FULL WITHIN THE BOOKING FORM. 2006 was actually when I bought the plot of land where Casa Convento now sits and it was completed in 2008. I have always worked in design of some sort, either in interiors, or as a stylist, writer and now, photographer, so it was a dream to design and build my own house, which we also spend time in whenever we can secure a week or two! My husband, a retired helicopter pilot, and I live in the beautiful, historic city of Bath. The Axarquia area is full of fabulous places to visit and has a great diversity of interest for all. We love the village of Canillas and its people, who are very friendly and greet everyone in passing. From here, it is easy to visit lots of lovely 'pueblos blancos', many of which you can spot from our panoramic dining terrace or sunbathing roof terrace. Behind is the unspoilt wilderness of the National Park, with access for walks right behind the house. We are only 25 minutes panoramic drive from the seaside and many beaches to explore. We have a favourite beach 'club' in Torre del Mar called Bahia de Tanit. Marbella etc are within reaching distance for a ritzy day out. I am always so pleased to have the wonderful response from my guests at Casa Convento who tell me it is utterly blissful, comfortable and way above the normal standard for a rental property. Everyone falls in love with the stunning views and sunsets, plus the real Spain of Canillas de Aceituno. Words such as 'Stunning', 'Heavenly', 'Superb', 'Paradise' are used in my Guest book and reviews. Both en-suite bathrooms have luxury fittings and double basins. The ground floor en-suite has a separate shower cubicle and second power shower within the bath. Heated towel rail and underfloor heating for winter. The first floor en-suite has tiles shower wall and power shower within the bath. Heated towel rail and underfloor heating for winter. The single shower room/utility has a power shower, toilet and basin too. The washing machine/dryer is here too. Towelling robes and house slippers are provided. Proper hair-dryers provided. Heated towel rails. Swimming towels provided. Aircon will be charged via a meter reading at approximately £15 per room per week. (Taken from dedicated meter so this is approximate only) I have to do this so people don't leave it on all the time! with built-in dryer if required. Very well fitted out with masses of gadgets, pans, dishes etc. FREE WIRELESS INTERNET All lighting has dimmer switches for more atmosphere! The air-conditioning is top-end but to be cost efficient there is an extra charge taken from security deposit (about £15 per room per week) There is underfloor heating for the winter; likewise this has a a charge of about £10 per room per week as per the dedicated meter reading. The cost will be taken via security deposit. For winter months there is a log-burning fire; enough logs for one fire will be provided. Logs easily bought locally. There is a charcoal in-built BBQ on the 3rd floor living room terrace. Due to the spiral staircase from 3rd floor living room to roof terrace and location of roof terrace and pool, this property is not suitable for young children/infirm/elderly. There is a strict NO SMOKING policy at the property. NB; Best to hire a reasonably compact car as parking space is restricted. Diesel is best for the hills! The on-line photographs do not do this magnificent property justice!! We had the most amazing time with all the interior facilities you could ever ask for!! This is the second time we have stayed at this property and it didn't disappoint. Set over three levels it is extremely spacious and very well equipped. 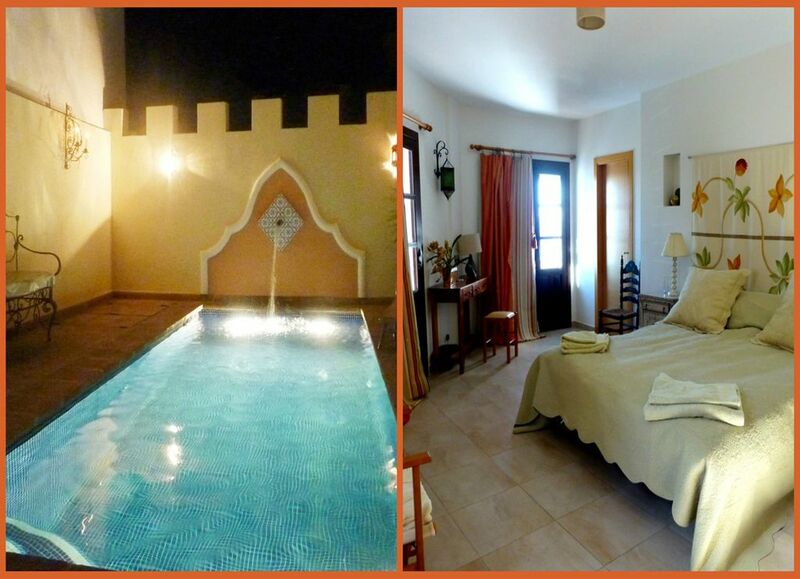 It really is a home from home with comfortable furnishings and lots of added extras like shower cream by the poolside. My favourite area in the house had to be the balcony, where I could comfortably sit for hours watching the comings and goings of the village below. I consider the village and Suzanne's beautiful property the perfect escape from the stresses of a busy life. I hope to return soon! This property really lives up to expectations. It is very well maintained and equipped, with excellent facilities and is very 'user friendly'. The owner ( Suzanne) has put much care and thought into making guests' stays as enjoyable as possible. The views from the outside dining terrace are stunning and the location of the house, within the village, means that all the local shops, bars and restaurants are within easy walking distance. The village is very friendly and it is lovely to feel part of the community, even for a small period of time. Terrific to hear that you enjoyed the house and village and I hope you will return before too long! Excellent property, excellent location. Casa Convento was the perfect place to stay for our first trip to Spain. The village, though small, has a variety of shops, restaurants, banks and bars for all everyday needs while larger supermarkets can be accessed within a 30 mins drive on the route home from the beach. The house is superbly equipped, very clean and comfortable and the pool was always welcome after a day exploring the fantastic countryside, towns and villages nearby. The views from the property are absolutely stunning throughout the day and you could not ask for a more romantic setting with a glass of Rueda at sunset. Always thrilled to hear good news about our guests' stay and so happy you enjoyed all aspects of your first Spanish trip. I hope there will be more in the future! We loved Casa Convento and Canillas de Aceituno from the first moment. Although it was very early in the year, we had on 12 from 14 days likely temperatures over 20° and less rain. Really not necessary to use the pool of course but we tried it sometimes, and after 2 sun days it was much warmer than the Sea. The view from the terraces is very beautiful, most from the upper one. You can see on the white small town, the mountains and when weather is clear look to the Mediterranean Sea. 20 mins from the buzz of Costa del Sol and Torre del Mar brings you to the peace and spectacular scenery of traditional Spain where pueblos blancos cling to the hillsides and the sights and scenery enchant year-round. The Axarquia region has a reputation for the best climate in Europe and, steeped in history, it has much to offer for exploration and sense-of-place, from the plethora of white-washed villages to the Nerja Caves' magical formations. Malaga has a beautiful historical centre - and excellent shopping - while Antequera and Granada are within exploring range. The beautiful drive from the coast brings you to Sierra Tejeda National Park and Canillas, where potted flowers decorate the side-streets, mules and goats studiously ignore humanity and the village ladies practice their flamenco in the evening cool. Walk, paint, photograph, picnic, listen to cicadas, taste local wine, sample village specialities – or simply enjoy the tranquillity and comfort of Casa Convento. Changeover day is Saturday during High Season unless by special arrangement if days either side are free. 25% non-returnable deposit on booking £200 Damage Deposit (payed independently from this platform via owner's bank) with full payment due 6 weeks prior to holiday date. (returnable less damages and air-con/heating costs) Air-conditioning and underfloor heating carry a charge cost-based on meter approx £12 per room per week; deducted from security deposit within 7 days of departure. IF PAYMENT IS MADE IN EUROS THE RATE OF EXCHANGE IS SET BY OWNER AT TIME OF DEPOSIT Please discuss short or long term rentals with the owner.